As an able bodied person with the ability to traverse through this earth effortlessly, I take for granted at times the simple things. In Hawaii something as simple as walking on the sand and enjoying the ocean are a way of life, but for some it might as well be another planet that they can never access. 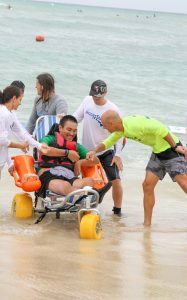 As a therapist to people suffering from spinal cord injuries and various neurological conditions, I’m exposed to people in situations that are hard for most of us to imagine, where just getting out of the house is a big job that would discourage most from even trying, yet the human spirit thrives in the most difficult of situations. 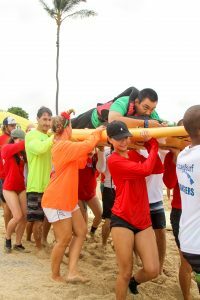 Through organizations like Access Surf, who provide access to the ocean for all, everyone has the privilege to enjoy the beaches and ocean. Meet Kepo’o. 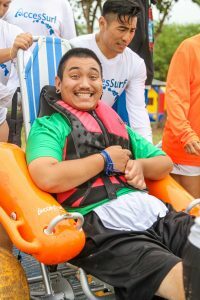 Kepo’o was injured as a young man at the age of 17 when he dove in to some shallow water and suffered a spinal injury paralyzing him from the neck down. He has chosen to not let that get in the way of his dreams, and he continues his passions for making music, he is furthering his education, and he also mentors others with spinal cord injuries at Queens hospital. 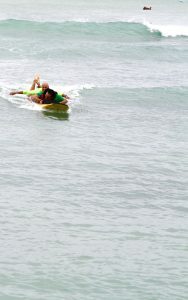 As his therapist, my role is to provide a therapeutic environment for him to thrive to his full potential, so when he told me he wanted to surf I smiled and of course immediately felt obliged to help him. for joy. I don’t think any of us will forget this ride.